It's all about food, wine, history, music, life, whatever takes my fancy, but mainly it's about food. 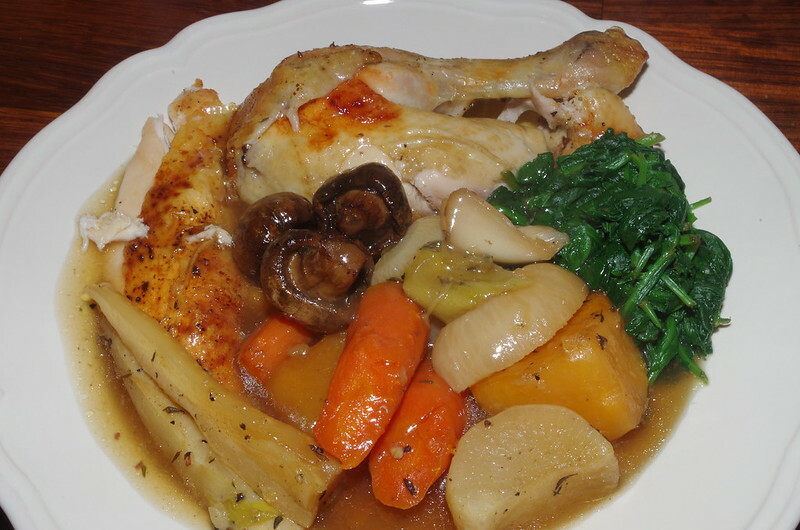 Yes, it is another chicken recipe, and it is even another pot-roasted chicken recipe, but I haven’t posted one in ages, so that makes it time for another one. Pot-roasting is the easiest one pot meal and also one of the best ways of cooking chicken. It retains all the moisture and juiciness you want, and it gives you lots of tasty vegetables and a nice stock to make gravy. What you cook with the chicken is really up to you, but at this time of year the best companions for the bird are root vegetables. 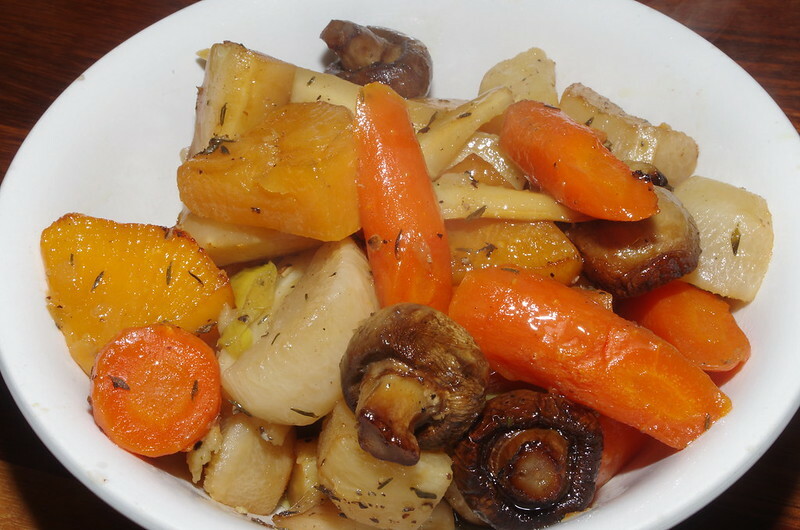 I used turnips, carrots, parsnips and swede (rutabaga). I also added in some roughly chopped leeks. You could also add in halved red onions or whole peeled shallots. You will also need some liquid. Chicken stock is fine, but you can also use booze. Wine is OK, if you want to make a creamy sauce to serve with the finished dish but I think that the best options are cider and beer. I’ve written about both before, most recently about using cider so this one is about pot-roasting with beer. You can use most kinds of beer here, but I’d avoid heavy beers and stout. They work better with beef. With chicken you need a lighter beer, ideally a dry, hoppy one. I used a bottle of Brains SA, which is dry, nutty-tasting and hoppy. There isn’t a great deal of work to do. 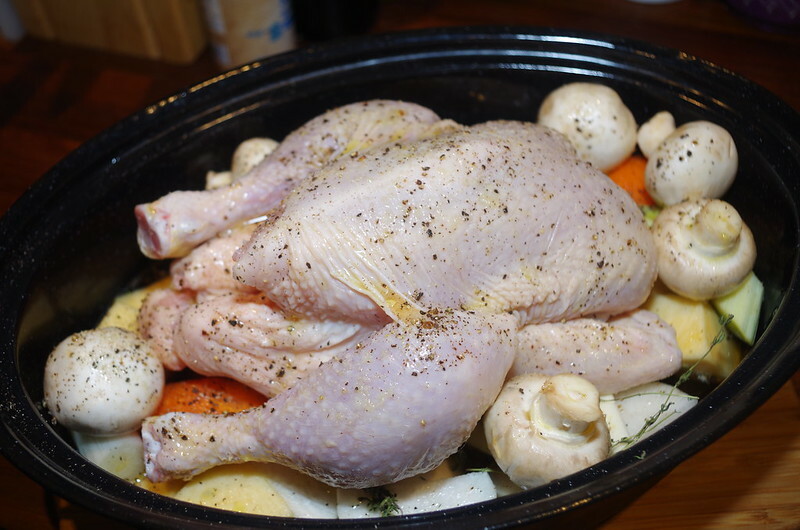 You just peel and chop your vegetables, put them into a suitable ovenproof casserole with a lid, season them, add whatever herbs you like (I used thyme), put the bird on top, pour over the beer and maybe some olive oil and put it in the oven at 160-170C for around an hour or so. As you can see, I put some whole mushrooms in with the chicken. They give flavour to the gravy and are also nice and juicy to eat. Half an hour before serving, pour off the stock that has collected in the casserole into a saucepan. This will be your gravy. Return the casserole to the oven and bake for another 30-40 minutes uncovered, so that the chicken skin becomes golden. Remove as much of the oily layer from the stock as you can and reheat with beurre manié or a cornflour paste to thicken it. You won’t need to rest the chicken, it will be very tender and juicy. Serve the vegetables separately so that people can help themselves at the table. You will probably want something green on the plate too. Cabbage or green beans work but I like spinach with chicken, so we had steamed spinach.